Sean Christopher Haire (February 25, 1971 – September 8, 2014) was an American professional wrestler, hair stylist, mixed martial artist and kickboxer. He was better known by his ring name Sean O'Haire. 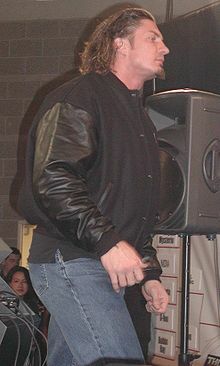 O'Haire was known for his appearances with World Championship Wrestling (WCW), World Wrestling Federation/World Wrestling Entertainment (WWF/E) and New Japan Pro Wrestling (NJPW) in the early to mid-2000s. He was a three-time WCW World Tag Team Champion, winning the championship twice with Mark Jindrak and once with Chuck Palumbo. He was also named "Rookie of the Year" by the Wrestling Observer in 2000. He retired from professional wrestling in 2006 to compete in both mixed martial arts and kickboxing and then become a hair stylist. On September 10, 2014, O'Haire's father found him hanged from a bedpost in his Spartanburg, South Carolina home. He had committed suicide the day prior, at 43 years old. It was reported that before his death, he had been battling depression and had been in a WWE-sponsored rehab six times for his substance abuse.